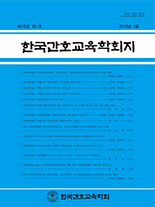 김명숙,(2011).간호학생의 전문직 자아개념과 전공만족과의 관계에서 자아존중감과 자기효능감의 조절효과.한국간호교육학회지,17(2),159-167. Purpose: The purpose of this study was to investigate moderating effects of self-esteem and self-efficacy in relationship between professional self-concept and satisfaction in their major among nursing students. Methods: Data was collected from 223 nursing students by means of a questionnaire. Data was analyzed with descriptive statistics, Pearson correlation coefficient and hierarchical multiple regression using the SPSS 12.0 program. Results: There was a significantly positive relationship between professional self-concept, self-esteem, self-efficacy, and satisfaction in their major. Self-esteem and self-efficacy showed moderating effects in professional self-concept and satisfaction in their major. Conclusion: This finding suggests the importance of moderating effects of self-esteem and self-efficacy to increase nursing student’s professional self-concept and satisfaction in their major. Therefore, strategies should be developed in order to promote self-esteem, self-efficacy, and professional socialization for satisfaction in the nursing major.